Still going chru photos. Still gotta hana. Dis is one hard day foa me. Hard foa concentrate. I look at alla photos and think about alla wasted potential foa one good relationship wit my madda. I’m glad I get da photos. Dey mean so much to me. Treasures. I jass wish she woulda been willing foa answer my questions… not hard ones. Just about her early years, life in Hawai’i, all lidat. What she thought, how she wen feel back den. Eh, u know wat? When we’re young, we nevah think to ask da questions, and by da time we like know, stay too late. Feeling sad today. But seeing myself so small, back in ku‘u one hānau, makes me feel litto bit moa bettah. Kinda. 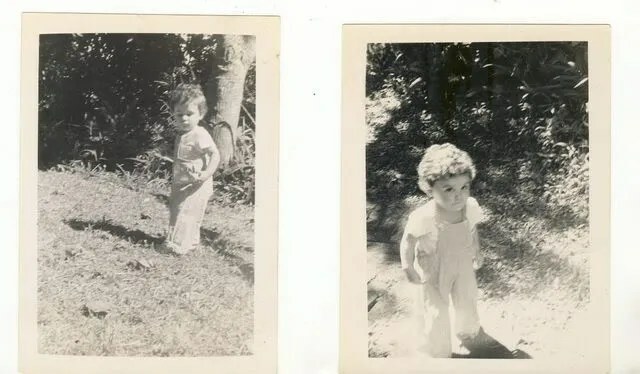 Me – 15 months old. Look like one little doll you. I love the photos. Cute keiki! My mother was very open with me when I was younger, but now she’s grown a bit distant. I try to get her to come visit, but she won’t. I try to visit, but probably not as often as I should.